With a College of Nursing ranked first among online graduate programs by the U.S News and World Report, online programs offered by the university include a Bachelor of Science in Nursing Program, RN-BSN program, Master of Science in Nursing program, Doctor of Nursing Practice Program, Accelerated doctor of Philosophy program and a Post Doctoral Program. In-state tuition costs $835 per credit hour while the figure rises to $985 per credit hour for out of state students. 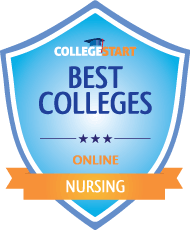 Accredited by the Commission on Collegiate Nursing Education, this private institution is ranked second for the best online MSN program in the U.S in 2015 by U.S News and World Report and first by college choice for the Best Online Master’s of Science in Nursing Programs. Online programs include a Master of Science in Nursing in Clinical Leadership, a Master of Science in Nursing in Executive Leadership, a Master of Arts in Curriculum and Instruction, a Nurse Educator certificate and a post-masters certificate in Clinical Leadership. The cost per credit hour for the Master of Arts program is $540 while the other programs cost $670 per credit hour. The graduate nursing programs offered by this university are ranked #2 among graduate nursing programs by the U.S News and World Report. Clinical Nurse Specialist, Health Systems Management, Health Systems Management/Clinical Nurse Specialist. Post degree programs available online at the university include Nurse Educator Program and a Psychiatric/Mental Health Nurse Practitioner program. Approximate per credit cost for each program is $1509. All online nursing programs offered by this university are fully accredited by the Commission on Collegiate Nursing Education. The university offers online Master’s, Post Master’s Certificate and Doctor of Nursing Programs in areas such as Primary Care Family Nurse Practitioner, Gerontology, Psychiatric Mental Health Nurse and Organizational leadership. Tuition and fees depend on residency and also on whether the student is a part-time or full-time student. For in-state students, part-time costs per credit are $819 while full-time costs add up to $894. For out of state students, part-time costs per credit are $985 and $1,061 for full-time costs. The university is ranked 5th in best online graduate programs by the U.S News and World Report and is accredited by the Commission on Collegiate Nursing Education. Online degrees offered include a Bachelor of Science in Nursing, RN to BS degree, Master of Science in Nursing Informatics, Master of Science in Nursing Leadership and Healthcare Systems (iLEAD) , Doctor of Nursing Practice and a Doctor of Philosophy (PhD) in Nursing. Online certificates offered include Palliative Care, Executive Leadership in Health Information Technology and Health Care Informatics. Accredited by the Commission on Collegiate Nursing Education, the Master of Science in Nursing degree program offered at Lynchburg College is both demanding and rigorous. It offers a broad range of academic and practical opportunities to prepare students for professional nursing careers. This degree program is offered conveniently online to prepare competent healthcare professionals. It is a 37-credit hour cohort program that may be completed in 18 months. Clinical experiences are included in the curriculum so as to give graduates adequate experience. Critical thinking skills and evidence-based practices are highly valued and students are taught to incorporate them into their nursing practices. Students become prepared for careers in: hospitals, clinics, schools, doctors’ offices, companies and the U.S military. They become effective leaders able to provide leadership in the practice setting and at the bedside. The University of Mississippi offers an online RN-BSN online program that is designed for registered nurses with an associate degree or diploma who would like to complete their baccalaureate degrees in nursing in a fun and innovative way. It is a flexible program that allows it’s students to quickly advance professionally as well as academically. Each student will have an individualized plan of study that is specifically tailored to meet their specific needs. Students become able to deliver comprehensive and professional population-centered care that reflects the best in nursing practices. They also gain expertise in the implementation of healthcare strategies so as to facilitate disease prevention, health promotion and health restoration among the population. 8. University of Detroit Mercy. The University of Detroit Mercy offers various online nursing programs through the McAuley School of Nursing. The RN-BSN program offered at this university is accredited by the Commission on the Collegiate Nursing Education. It explores topics such as: healthcare informatics, leadership in transformational practice, healthcare ethics, project development and pathophysiology for the practicing nurse. Students receive instruction in the theoretical aspects of health information technology and it’s application in healthcare management. They also discuss the moral questions raised in the delivery of healthcare, health care policy and biomedical research and their application in abortion, human experimentation, euthanasia and professional-patient relationships. The total number of credits required to complete this degree program isn126 credits. Various financial aid options exist and students are encouraged to explore them.